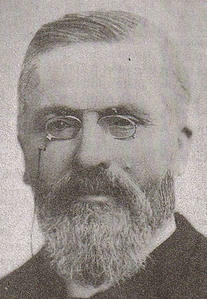 Today in Masonic History Frédéric Desmons is born in 1832. Frédéric Desmons was a French politician. Desmons was born on October 14th, 1832 in Bringon, France. He attended the Collège d'Alès. He then went on to the Faculty of Theology at the University of Geneva, which was the center of Calvinism (John Calvin himself founded the school in 1559). He graduated from the school in 1855 with a Doctor of Theology. In 1856, Desmons returned to France and became a pastor in the Reformed Church of France which came from Calvinism. He worked in a various parishes from 1856 to 1881. In 1877, Desmons entered politics. This became an issue for him with his position in the Reformed Church. He was attacked from within his own Republican party in France. The Republican part of the time believed in the separation of church and state, Desmons was no exception to this. There were those that criticized him claiming that as a clergyman he was not able to truly be objective about the situation. Desmons served in the Parliament and the Senate. Desmons passed away on January 4th, 1910. Desmons was initiated into Lodge L'Echo. He is most notably recognized as the architect of what would become known as Liberal Masonry or Latin Masonry. Liberal Masonry has largely removed the references to the Grand Architect of the Universe (GATU). Desmons believed, as was indicated by a speech he gave that Freemasonry was a place for scientific discussion not a place for discussion of Dogma. He believed that in Freemasonry, just like in government, that there should be a separation between faith and institution. Although Desmons is often credited with creating the rift that caused the United Grand Lodge of England to revoke it's recognition of the Grand Orient of France, the idea of Liberal Masonry had already taken hold in other Grand Jurisdictions including the Grand Lodge of Hungary and the Grand Lodge of Buenos Aires.